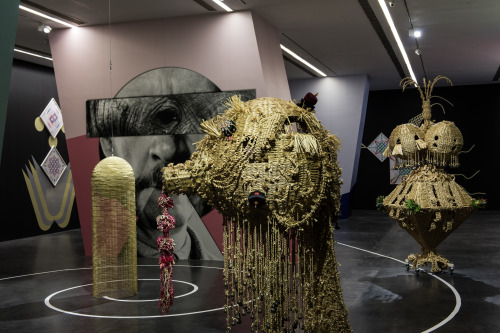 From 30 October 2015 to 3 January 2016, the Ullens Center for Contemporary Art (UCCA) is pleased to host the first solo exhibition in China of Haegue Yang. 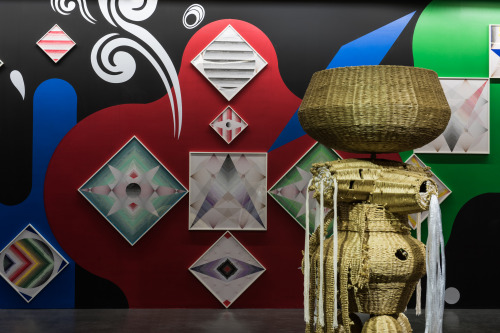 “Haegue Yang: Come Shower or Shine, It Is Equally Blissful” includes the artist’s major works from 1994 to the present with newly commissioned sculptural installations. 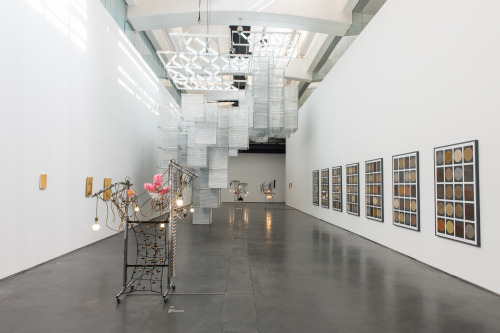 Through the Lobby, Nave, and Central Gallery, viewers navigate the plurality of Yang’s unique visual language, a landscape of material hybridity—spices, Venetian blinds, clothing racks, synthetic straw, Choco Pies, bells, graph paper—torn, lacquered, woven, lit, and hung. Here, Yang attempts to stage diverse narratives of nameless subjectivities in a syncretic mode of abstraction and figuration that does not seek a balance between the two. In reference to an idiom found in the poem “Drinking on the Lake when it Shines after the Rains” by the Northern Song dynasty scholar Su Shi, the exhibition’s title suggests high spirits in spite of dramatic shifts in the environment, the embrace of diversity in our world. It also alludes to the artist’s preoccupation with sensorial experience, which triggers associative sentiments beyond the verbal and conceptual. Lacquer Paintings such as Rainy Dirty (2012) or Rainy Chili (2011) display impressions of seasonal and environmental conditions acquired in the production process: lacquer is poured onto wooden panels in multiple layers then set against the elements outdoors. Exposed to rain, wind, and other disturbances, their surfaces become dotted and dusty, recording the specific season and place of their creation. 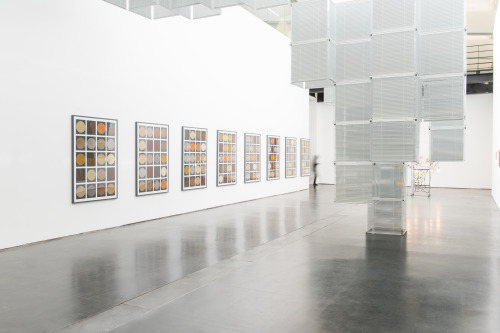 Similarly, Spice Moons (2013), eight framed panels of spice prints, line the opposite wall of the Nave, carrying the scent of Singapore’s diversity and colonial history into the exhibition space. 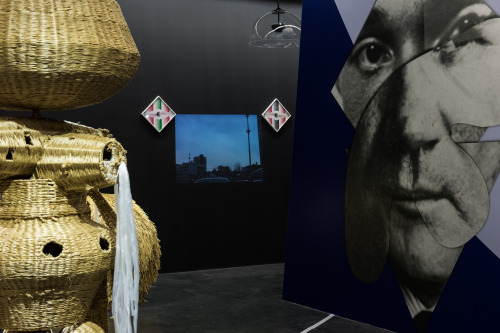 Through visual and titular references, the two series suggest a connection between celestial bodies, the moon and stars, and human perception. Hanging from the rafters of the Nave, Sol LeWitt Upside Down – K123456, Expanded 1078 Times, Doubled and Mirrored (2015) consists of twin volumetric shapes, tropes of LeWitt’s K123456 (1997) expanded and mirrored with Venetian blinds. Becoming opaque or transparent according to the natural light of the space or standpoint of the viewer, the piece approaches the original not as parody but as a compositionally liberated expression of respect. 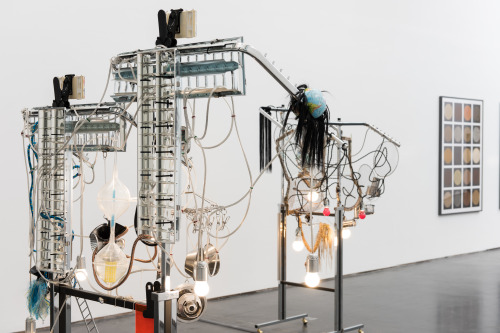 Totem Robots (2010), a sculptural installation in three parts titled Sidewise, Askew, and Forward, also share the Nave, their ‘arms’ and ‘heads’ draped with electric cables, light bulbs, and other ephemera emptied of function. 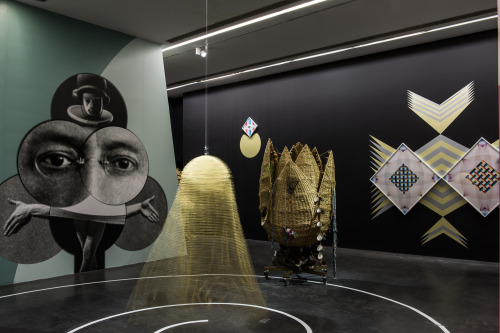 These accumulated anthropomorphic features can also be found in the new sculptural group The Intermediates (2015) and the wallpaper series Eclectic Totemic(2013)—completed with London-based designer duo OK-RM (Oliver Knight and Rory McGrath)—situated in the Central Gallery. Titled “The Sun and the Moon: The Golden Crow and the Jade Hare,” the floor is drawn according to a spiral pattern found in Oskar Schlemmer’s Triadisches Ballett (1922), the straw figures of The Intermediates, adorned with a Korean bridal headpiece, vintage Indian cowbells, and artificial succulent plants among other things, ‘dance’ in a whimsical ritual allowing an experiential shift in their assumed objectivity. 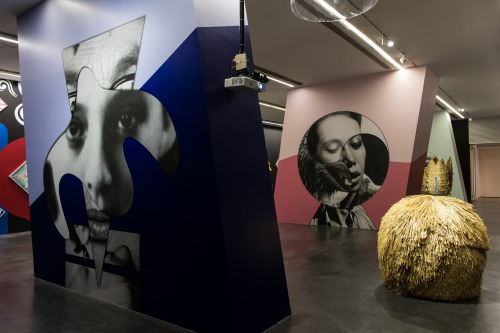 The Central Gallery is entirely wrapped and rendered by wall décor with the paper collage series Trustworthies (2010-) on vinyl arrangements. Video Trilogy(Unfolding Places, Restrained Courage, and Squandering Negative Spaces, 2004-2006) is embedded within the Trustworthies, featuring an intimate voice-over monologue unfolding episodes of observations on homelessness and displacement collected during lonesome journeys. The narrator’s voice flows over sequences of urban scenery interrupted by occasions of origami, masked figures, or paper windmills. In the Lobby, viewers are welcomed by Virtuous Edibles – Affection and Benevolence (2015), two towers—each weighing approximately 500 kg, altogether a ton—constructed from Choco Pie packages with the characters of 情 [affection] and 仁 [benevolence] delineating the product markets of Korea and China, respectively. Monumental in scale, the work posits a contrast between the intimate, familiar taste of the snack with its ever-changing commercial image, while highlighting the notion of virtue attained through the application of an otherwise trivial commodity. An extensive exhibition catalogue, “Haegue Yang: Come Shower or Shine, It Is Equally Blissful” explores the affective power of industrial materials, revealing a spiritual threshold in the ordinary. Within the internalized movements of Yang’s diverse practice, several iterations of alternative temporality are attempted: the appropriation of Sol Lewitt’s progression in geometric shapes (Sol LeWitt Upside Down – K123456, Expanded 1078 Times, Doubled and Mirrored), astronomical phenomenon reflected in shifts of human perception (Lacquer Paintings, Spice Moons), and the syncretism of tradition with the economic undercurrents of sweetness in a popular Korean snack (Virtuous Edibles – Affection and Benevolence). Each signifies movement in spite of static form, citing instances outside the insomnia of their inscribed utilitarian time.